What an absolute delight to enjoy the pleasure of an indoor swimming pool! It is so relaxing to swim in a large pool, safely at home, in your own living room or veranda. You are setting up your future house plans and you wish to include an indoor swimming pool? It is the right moment to contact MARINAL. You envisage architectural modifications to your house and you would like to integrate an indoor swimming pool in your veranda? The MARINAL advisers can help you through your project. You can use it all year round, no matter the weather, the outside temperature or the season. You do not have to worry about the way to close you swimming pool for the winter. You have a special place where to relax at any hour, right at home. The water will always be at the right temperature, and you won’t feel cold while coming out of the water. 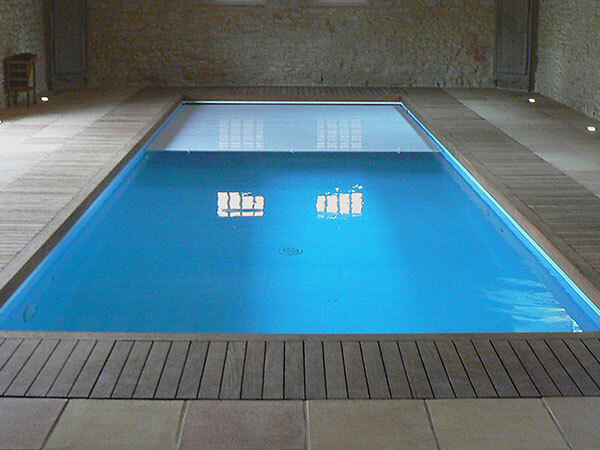 You can swim all year round even if your indoor swimming pool is not large, by installing a counter current system. You can add some spa nozzles and create a spa area in your indoor swimming pool, to make it even more relaxing. But to avoid condensation in your house, it will be necessary to well ventilate the room where your indoor swimming pool is installed. It will certainly be necessary to install a dehumidifier. As with any project of reinforced concrete swimming pool, the price of an indoor swimming pool will depend on its size and its coating, but also on the technical constraints. For a precise study of your indoor concrete swimming pool project, please contact a MARINAL adviser via our on-line contact form.